One sunny evening, 10-year-old Rhona goes missing. Her mother, Nancy, retreats into a state of frozen hope. Agnetha, an American academic comes to England to research a thesis, ‘Serial Killing – a forgivable act?’ Then there’s Ralph, a loner with a bit of previous who’s looking for some distraction… Drawn together by horrific circumstances, these three embark upon a long dark journey which finally curves upward into the light. 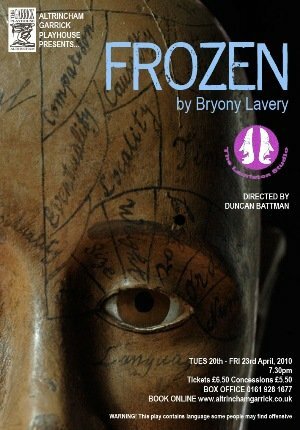 BARRY Hall's performance in?Frozen?is, quite simply, one of the best I've seen on the amateur stage. He puts his heart and soul into playing the dangerous and damaged Ralph, a misfit responsible for a string of child murders. It was a brave decision of the Garrick's Lauriston Studio to stage Bryony Lavery's uncompromisingly challenging play, which forces us, as theatregoers, to confront the subject of paedophilia head on. But for me live theatre is at its best when it challenges us. ?Frozen?also makes us question how society should treat people like Ralph. Is he ill, or just plain evil? This may all sound terribly heavy but Lavery, who has to be one of the most intelligent writers around, even manages to introduce some humour into proceedings. While Hall's performance is totally mesmerising, that should take nothing away from the immense contribution of Julie Cunningham who plays Nancy, the mother of the murdered Rhona and Jacqueline Wheble, as the straight talking and emotional American "shrink" Agnetha. It's impossible not to be touched by Nancy's courage and dignity and the scene in which she meets Ralph in prison is heart stopping stuff. A triumph for all concerned, including director Duncan Battman who has ensured no-one will leave the Lauriston unaffected by what they've seen on stage. ?Frozen?is a superb piece of writing, superbly acted.